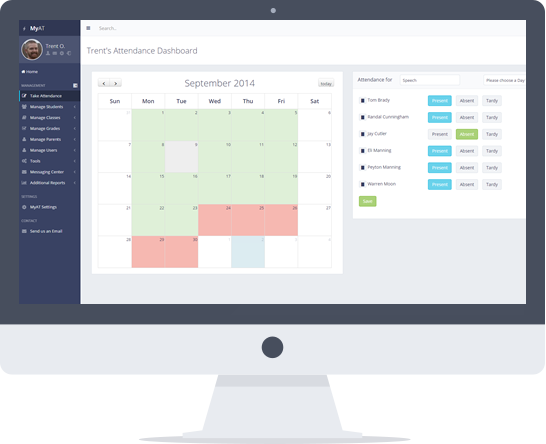 Track School Attendance and Grades From Any iOS or Android Device! Simply signup and use your iOS or Android browser to manage all of your employees or students tracking for free in no time at all. No more writing down notes, attendance, or grade information on students or employees just to enter it into a different system later. Open your MyAT account on any smart phone or tablet and record any information you need right then, one time, and access it from anywhere and anytime you want in the future. Information is accessible to anyone else in your school or company in real-time, from anywhere. Specially designed interface specifically for mobile devices so you can do what you need to quickly without hassle. All MyAT features are available on your iOS or Android device just as they would be on the web. No paired down or lightweight apps here. Building the mobile interface to work as well (if not better) on your Android or iOS devices was probably one of the largest efforts I've undertaken since I started building MyAT years ago. When I started building this for my wife we barely had smart phones and certainly not ones capable of the things that today's devices are. Today teachers, instructors and managers need to access their data wherever and whenever they want it. I think I've done that with the upgraded interface and hopefully made it pretty great looking as well. Try it out and let me know if you have any suggestions on how I can make it even better.